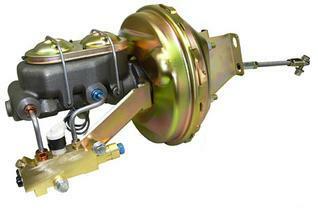 Note: Four wheel drum brake application kits do NOT include a proportioning valve, bracket, or lines. 1960-1962 Power Brake Booster Kit (Drum/Drum) - GM Truck This is for drum brakes in the front, and drum brakes in the rear. 1960-1962 Power Brake Booster Kit, Zinc (Disc/Disc) - GM Truck This is for drum brakes in the front, and drum brakes in the rear. 1960-1962 Power Brake Booster Kit, Zinc (Disc/Drum) - GM Truck This is for drum brakes in the front, and drum brakes in the rear. 1963-1966 Power Brake Booster Kit (Drum/Drum) - GM Truck This is for drum brakes in the front, and drum brakes in the rear. 1963-1966 Power Brake Booster Kit, Zinc (Disc/Drum) - GM Truck This is for disc brakes in the front, and drum brakes in the rear.